La Rinconada Restaurant. 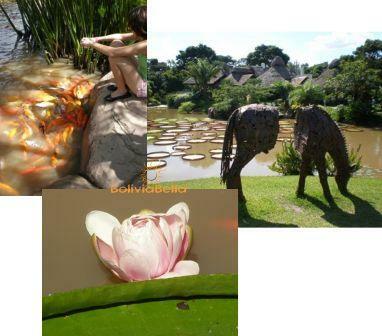 Bolivias Garden of Eden! The Menu is Sinful Too! Tucked into a corner of the jungle just 6 miles from downtown, it is so idyllic and peaceful you’d never know you were just 15 minutes away from a city of 1.6 million! Across the Piraí River, around the Colinas del Urubó bend, through a small elite neighborhood, a turn off to the right, and suddenly you’re on a dirt road in the middle of nowhere, amazed at the silence. With nothing but thick vegetation, native palm stands, and the occasional roadside cow dozing in the shade of a jatata thatched roof, you should have no trouble following the many rock-shaped signs that will lead you to this beautiful oasis. (Look for huge artificial rocks along the side of the road with “La Rinconada” carved into them as well as several painted signs). 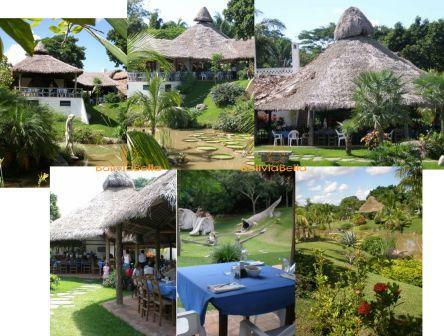 Although this restaurant is a local favorite and well-known for its colorful and wholesome Sunday buffet, (with seating for 750 and believe me it fills to capacity), the property itself is more like a lush tropical resort. Your first view will be of the shallow wading pool where children can play in the water among a collection of hilarious cement animals (I like the singing froggy fountain). To the right is a cement-animal playground with elephant slides, a crocodile toboggan, and funny seesaw froggies (my favorites, again). To your left you’ll notice a sand volleyball court and two more pools, one with a water fall. These are deeper and kids should be accompanied by adults. (No lifeguards). Ahead you’ll see a massive open-air restaurant covered with a series of high, round jatata (palm frond) roofs. As you walk uphill, your eyes will widen in amazement when you see the lake beyond. Dozens of giant Amazon-sized lily pads, some up to 6 feet across, float among thousands of orange and white koi (giant goldfish), which you can feed at the wooden dock near shore. (You have to buy the fish food at the bar). Your first impression of the restaurant will be how spacious it is – but then your other senses will take over as you take in the sights and smells of the buffet. Colorful salads, bowls of ceviche for starters, and an array of traditional Bolivian meats and side dishes served in huge, hot clay pots will bring you back to reality. By now your grumbling tummy will be begging you to take a seat. The best part is you don’t have to sacrifice one thing for another. High atop the hill, you can enjoy these gorgeous surroundings, take a deep breath of cool, shady breeze, watch your kids as they play in the park, and try a little of each delicious dish, all without taking a single step. So eat until you’re lazy! Because you’re welcome to stay and spend the entire day relaxing and doing a lot of nothing at all. After lunch, take a slow walk down to the dock and feed the fish, stroll through the immense gardens, relax in one of the three cool pools, or sleep under a tree. Your kids will keep themselves busy on the 40-foot cement toboggans (located behind the restaurant), on the go-karts, or in the parks and pools. And bring your camera because you won’t know where to begin (or stop) taking pictures. La Rinconada is open Tuesday through Sunday and closed Mondays. The lunch-only Sunday buffet is served between about 11:30 to about 3:00. On Tuesdays through Saturdays you can order a la carte meals too, and there is a full bar and lots of other beverages. Also Tuesdays through Saturdays from 3:00 to 6:00 you can enjoy a traditional Bolivian tea time with the usual baked goods like empanadas, cunapés, and other delights. 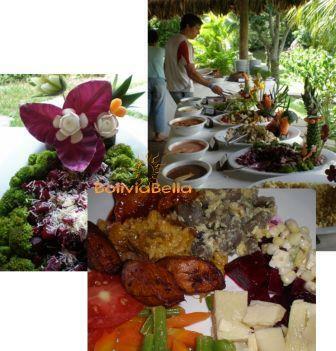 The buffet offers several great salads (corn, hearts of palm, beets, beans, carrots, lettuce, tomatoes, you name it) along with wonderful salad dressings. I love how they decorate each salad dish with little birds and flowers and other animals carved out of vegetables. Desserts often include caramelized flan, cakes, and an enormous colorful fruit salad that is just the perfect refreshing touch on a hot day! Try the flan too if you’re a sweet tooth. 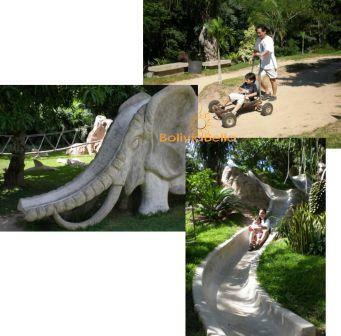 For a modest entrance fee you can spend the day relaxing and strolling the lush surroundings, and playing in the parks. Your fee pays your entrance and use of the pools (you must wear a swimsuit and shower before you swim). You’ll be greeted at the entrance, where you’ll pay the fee of your choosing, depending on what you want to do. The cashier will give you a wrist bracelet to wear – you must wear it or you won’t be able to use the pools or enjoy Adam and Eve’s favorite Bolivian food and desserts! Once you’re inside, you can stay as long as you like. Gates open early (at 9 a.m. and close at 6 p.m.), so plan to spend the entire day. 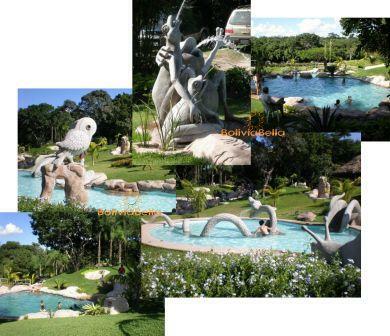 There is so much to do at La Rinconada that I've actually also listed it under the Tourism section of my site. It's hard to classify this restaurant/resort/nature preserve. With its lush tropical surroundings, La Rinconada is (literally) a natural favorite for events like weddings, birthdays, and even workshops and seminars. There’s even a breezy lakeside chapel! For event reservations contact Ilani Ribero at 708-99708 (this is her cellular phone) or email La Rinconada. You can also call their offices at 322-1622, and you'll (soon) be able to visit their new website. If you don’t drive, take a radiomóvil – all the local taxi drivers know how to get here. Click on this map to La Rinconada if you prefer to drive here yourself. It's so easy! One last interesting fact: In January 2006 one of the giant lily pads at La Rinconada was measured at 2.78 meters across (that’s nine feet!) and won a world record! You can read all about it (they're called victorias here) from Tonchi Ribero, owner of La Rinconada. He'll tell you in his own words all about his love for landscaping and how his dream became reality. You can tell La Rinconada was founded on love. Click here to read all about Tonchi Ribero's Own Private Eden. So treat your tummy, cool in the pool, soak in the sun, or sleep in the shade, because at La Rinconada, all is well with the world.